Spoken Futures is working to reanimate La Pilita (420 S. Main Ave., Tucson) as a community arts center focused on storytelling, memory and cultural literacy. 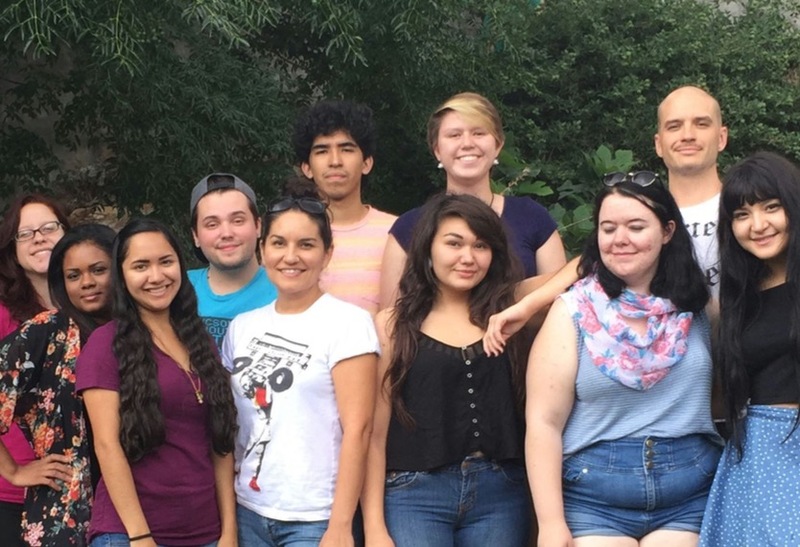 As a focus point of Tucson’s heritage and Latino cultural expression, La Pilita is a site uniquely positioned to convene a new generation of youth poets, bilingual storytellers, researchers and dramaturges. As the new tenant of La Pilita, we will work to create a space where youth and adults (barrio residents and members of the wider community) can engage the arts and local history. Initial proposed programming includes weekly youth­ centered poetry writing workshops, an open mic night, and a Shadow Puppetry youth ensemble in partnership with Carrillo Elementary School next door. Borderlands Theater’s Barrio Stories play would be the first in a series of “projects in residency” which would bring new energy and barrio ­related content to La Pilita, through use of of the center as rehearsal and arts based meeting space. Who We Are: Spoken Futures, Inc. Spoken Futures, Inc. widens access to the literary arts and community engagement for young people across Southern Arizona. Through dynamic competitions such as the Tucson Youth Poetry Slam (a monthly event founded in 2010) and innovative social justice programs such as Liberation Lyrics, Spoken Futures creates youth­centered spaces. Through dedication, reverence and love, we use poetry as a tool to dream tomorrow, honor yesterday and live today. Since 2010, over 6,000 young people across Tucson and Southern Arizona have participated in Spoken Futures’ programs. Spoken Futures Codirectors and Barrio Viejo residents Sarah Gonzales and Logan Phillips are bilingual community organizers and artists based in Tucson. Borderlands Theater has been championing the development and production of new plays that resonate with their diverse audiences for over 30 years. Borderlands breaks new ground with a site­specific theatrical event full of spectacle: the Barrio Stories Project by award winning playwrights, Elaine Romero, Virginia Grise, and Martin Zimmerman. Involving communal memory, food sharing, and reclaiming of space, this cutting­edge event brings to life the oral histories of former residents of the neighborhood demolished with the building of the Tucson Convention Center in the 1960s. Borderlands plans to stage the play outdoors, on the grounds of the Tucson Convention Center. Precious memories come to life as audience members walk approximately a tenth of a mile on a tour of what used to be the bustling epicenter of commerce and public life for Tucson’s Mexican­American community. The Barrio Stories Project is an innovative creative placemaking effort to activate underutilized spaces through partnerships between arts, educational, community, and civic institutions, while preserving Tucson’s Hispanic heritage. Producing Director Marc David Pinate brings twenty years of theater experience and contacts in the San Francisco Bay Area and Chicago to Tucson. His mission as the new head of Borderlands Theater is to make theater more accessible to all Tucson residents and reflective of Tucson’s bounty of rich local stories/history. In 2013 he moved his family to Tucson to write a play about the Ethnic Studies debate that rocked TUSD, two years later this significant work is part of a national showcase of New Latino Plays being held this summer in Chicago and its world premiere will take place this September in Tucson. He is the lead artist on the groundbreaking Barrio Stories Project which will happen in 2016. Last March, he organized over 100 community members to build nine giant (10 foot tall) puppets to tell the story of Cesar Chavez, Dolores Huerta and the farm workers movement for the 15th annual Cesar Chavez March and Rally. He is currently negotiating with TUSD to create an after school shadow puppetry program at Carrillo Elementary that will use vacant lots in Barrio Viejo as placemaking sites to tell the local folk tales in Patricia Preciado Martin’s award winning book, El Milagro and other Stories,through the magic of shadow puppetry.